We just completed a major equipment upgrade in our Dolby Atmos Home Theater Room, and we are thrilled with the results! While the theater room may look the same (except for the MASSIVE new screen on the wall), the effect is an entirely immersive movie experience, unlike anything we have done before. The new equipment totaled close to $40,000. 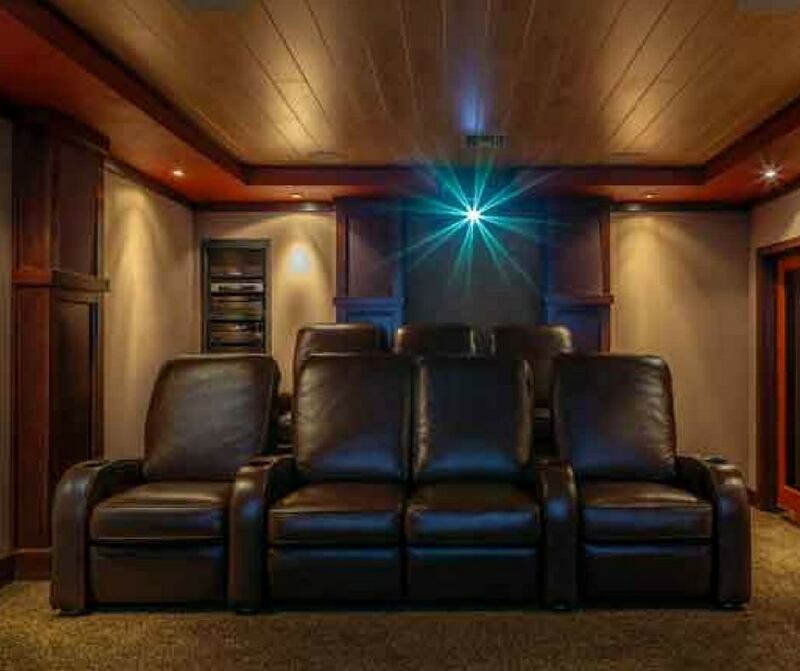 It included a new screen, 11.2 channel Dolby Atmos surround sound processor, 4K projector, true cinema widescreen projector lens and new theater seating. To improve the Dolby Atmos presentation, we started by replacing our 125-inch screen with a giant, 160-inch, acoustically transparent screen from Screen Innovations. That’s over 13 feet or as big as an elephant! The screen now fills the room, and because it is acoustically transparent, we were able to move the center channel from its previous position (above the screen) to the best position (center) and hide it behind the screen. When it comes to watching movies, we all want the biggest screen we can afford. This one does extra duty by improving your sound quality and hiding the center channel. 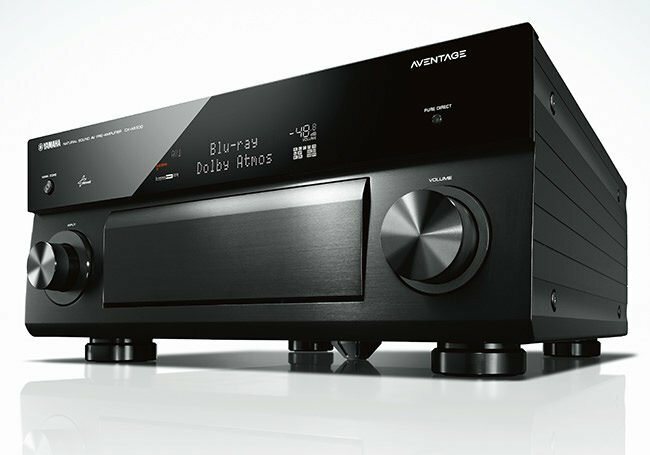 For 11.2 channel Dolby Atmos surround sound processing, we selected the Yamaha Aventage CX-A5100. The top-of-the-line in the Aventage series, the CX-A5100 preamp processor, is a powerhouse. It provides three-dimensional surround sound with Dolby Atmos, advanced Yamaha digital signal processing with CINEMA DSP HD3, and utilizes the best built-in functions for customization so you can enjoy all the latest home theater technologies available. Now with MusicCast, this device can be expanded to deliver wireless multiroom audio playback, all controlled by a simple app. 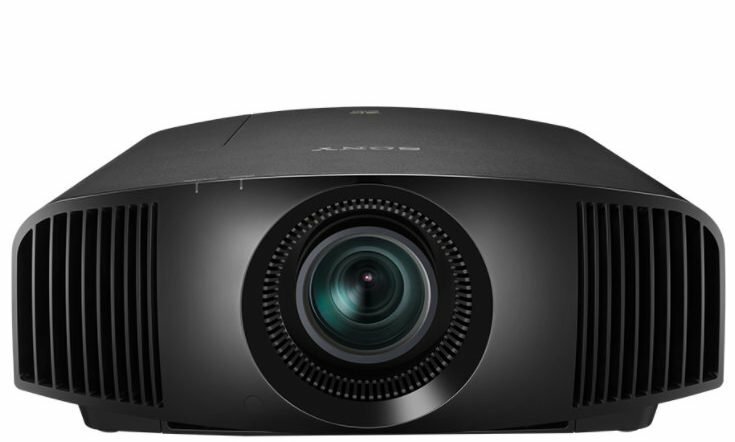 The Sony 4K SXRD Home Cinema Projector provides breathtaking image clarity. It offers rich colors, 1500 lumens brightness and a spectacular dynamic contrast range for vibrant, detailed pictures that always look clear and sharp. Reality Creation upscales Blu-ray Discs™ and DVD movies to near-4K quality. To further enhance the Sony SXRD Home Cinema Projector we added a Panamorph UH480 UltraWide Projector Lens. Home theater projectors display the aspect ratio of standard HDTV, but 70% of the most popular movies are made in UltraWide format. 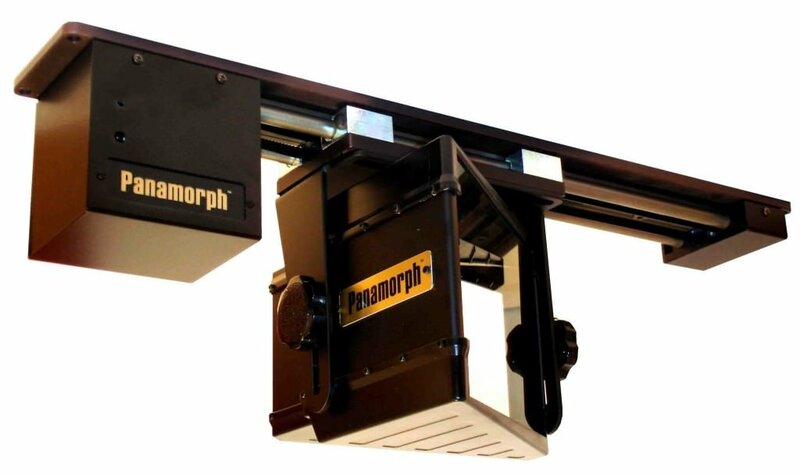 The anamorphic lens converts the picture to UltraWide cinema format. 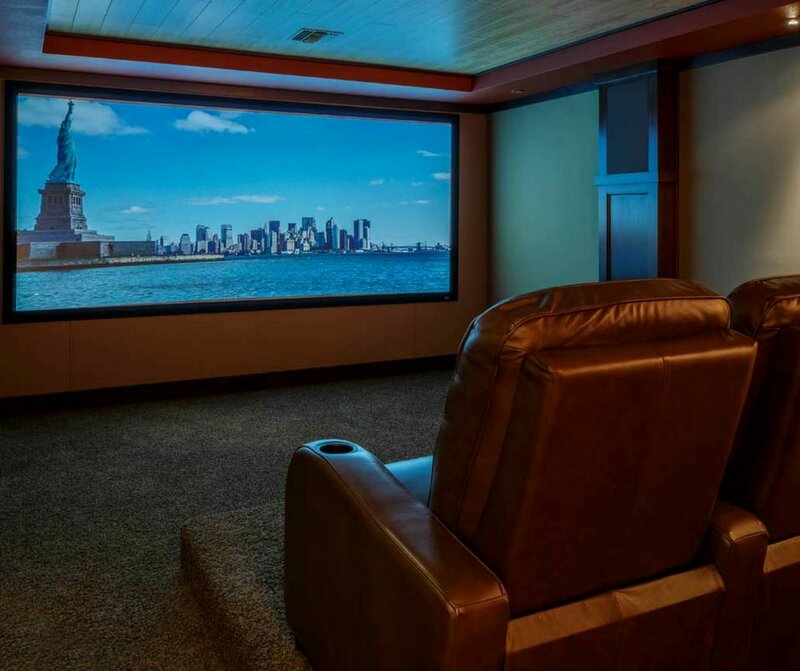 You gain over half a million more pixels on the screen for higher brightness, higher definition, no unnecessary light loss, no more black bars, and you increase the overall visual performance of the entire home theater investment by about 30%. For seating that is as comfortable as it is beautiful, we chose theater chairs from the Pacific collection by United Leather. Made in the USA, United Leather offers more than 30 styles of theater chairs (composed of several modular elements) which can be combined to form almost any combination of curved or straight rows. Each style is available in a wide variety of colors and textures designed to meet your unique needs and discriminating tastes. Loveseats and sofas are also available for in each style. You don’t have to be a kid to love lounging in these super comfy, oversized dreams. CuddleBag Loungers are excellent for expanding your seating by filling the spot at the front of your theater that usually sits empty. They are perfect for movie watching (and napping) and are always a huge hit with both kids and adults. Round and oval CuddleBags are available in several fun colors. 6-foot round CuddleBag $589.00. 6-foot oval CuddleBag $549.00. Stop by our showroom and experience our incredible new Dolby Atmos home theater.